Moscow has struck a devastating political blow against the West yet again, especially against its Middle Eastern policy, with Syrian President Bashar al-Assad visit to Moscow on October 20 to meet his Russian counterpart – Vladimir Putin. Spokesman for the Russian President, Dmitry Peskov said talks were held in both narrow and expanded format with the participation of key figures of Russia’s government. “The talks were held for a long while, and their subject is quite clear,” – said Peskov. 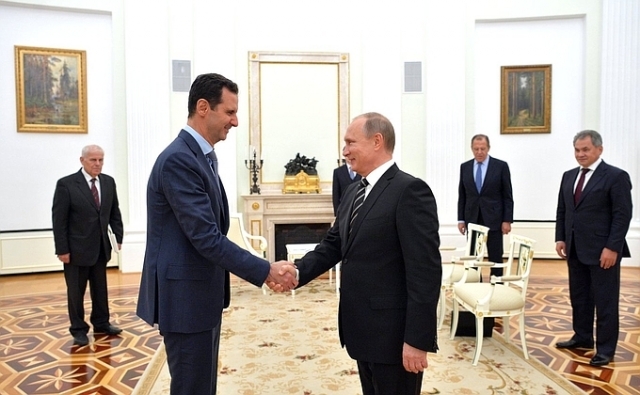 Assad relayed to Putin about the situation in Syria and upcoming operations Syrian government troops. The two leaders have also discussed topics related to the participation of Russian Air Force warplanes in those operation. “The most pressing topics were the fight against terrorist groups and the extension of Russian operations to support the offensive of the Syrian armed forces, “- said Peskov. Peskov did not specify whether the political future of Bashar al-Assad himself was discussed or not. Moreover, Russia is willing to assist Syria in the search for a political solution to the crisis in the country. “On the basis of positive dynamics in combat, in the end, a long-term settlement will be achieved with the participation of all political forces, as well as ethnic and religious groups. The Syrian people certainly must have the final say. – Vladimir Putin said after the meeting was over. It is clear that such an unexpected visit does not pursue the goal of detailed discussion of specific aspects of bilateral cooperation. Those are usually carried out by experts and heads of government bodies, in this case they were held by Russia’s Minister of Foreign Affairs Sergey Lavrov and the Defense Minister Sergey Shoygu. The main goal of the Russian-Syrian talks was a demonstration of the determination that both Moscow and Damascus both have to put an end to ISIL or any other illegal armed group, created at the expense of Saudi Arabia, the United Arab Emirates and Qatar with an extensive amount of support from the US, Turkey and Jordan. For the last three weeks, while Russian warplanes have been obliterating extremist groups in Syria, Russia has been repeatedly offering the White House broad cooperation at the highest level in the fight against ISIL, starting from the coordination of air strikes and ending with intelligence data sharing. Washington and Barack Obama personally have continuously turned down these calls. Moreover, last week the US president, after consulting the Assistant Secretary of State for European and Eurasian Affairs Victoria Nuland, refused to receive a high-level Russian delegation led by Prime Minister Dmitry Medvedev that sought to discuss a wide range of topics related to the situation in Syria. At the same time Moscow has openly stated that it’s critical at this stage to preserve the government of Bashar Al-Assad, while the Syrian Arab Republic is caught in a middle of a brutal war with hordes of foreign mercenaries. Once this war is over, an internal political settlement can be pursued, but only on the condition that Syrians themselves decide the fate of their country, leaving foreign and regional forces with no say in this matter. Yet, while being unwilling to seek any form of cooperation, the United States has been heavily engaged in sabotaging Russian initiatives, while pushing Saudi Arabia and Turkey to provide even more support to the so-called Syrian “opposition.” Moreover, Washington has even armed and prepared a “new moderate opposition” force, spending some 500 million dollars on this latest project, only to see this “opposition” joining the ranks of ISIL, Jabhat al-Nusra, Ahrar ash-Sham and other radical Islamist groups. And, curiously enough, not a single US general or official was punished for this “miscalculation”. And it’s perfectly logical, since the goal of strengthening ISIL and it’s allies was ultimately achieved, although some people would probably believe that “moderate terrorists” did somehow trick their American instructors who were teaching them how to fight the Syrian Army. At the same time, Washington has been active in ruining relations between Ankara and Moscow, while pushing Tayyip Erdogan into making harsh anti-Russian statements. There’s no point mentioning Europe here, since the practice of turning down official Russian delegations has become a tragic norm among European countries. What is worth mentioning may be provocations like the recent pursuit of a Russian plane with the Chairman of the State Duma Sergey Naryshkin aboard by a NATO plane in Swiss airspace – an outrageous provocation. Putin can be easily understood. For months and months he stretched out his hand in an attempt to peacefully settle the conflict in Ukraine, that the West created in the first place to undermine Russia’s growing military and economic strength. For American cannot stomach the fact that someone could challenge US leadership in the world, which, in fact, ceased to exist a while ago. After all, in terms of GDP, China has beaten the US hands down, and Russia’s Caliber missiles hitting their targets in Syria after traveling 900 miles, revealed the vulnerability of the entire US defense system. Moreover, the US has no weapon systems that can match Caliber today. As for the military capabilities of Russian aircraft, they’ve been on display all across the globe for the last three weeks. A handful of Russian warplanes have inflicted more damage on terrorist infrastructure in Syria than the whole US coalition could deal in a year. Moreover, the Syrian army has already launched a counteroffensive and now is recapturing territory that was held by militants backed by the USA, KSA, Turkey, Qatar and the UAE. In response, the Turks and the Saudis are trying to increase the flow of refugees to the EU by employing their intelligence agencies. Then the would tell the world that Syrians fled due to Russian airstrikes, and it’s in no way connected with the fact that Saudi Arabia is giving money to those refugees, while Turkey ships them to Europe. And then there’s rumors that the Deputy Crown Prince Mohammad bin Salman Al Saud tried to convince Russia to abandon Syria by offering its officials 300 billion dollars. The only question is where could Riyadh find this kind of money, when its own budget is being rapidly exhausted. The West is now desperate enough to publish any kind of propaganda, even if it’s complete nonsense. Ultimately, as the Arab proverb says, “patience has its limits.” Vladimir Putin used to send positive signals to the West, but the visit of Bashar al-Assad to Moscow has shown that the line has been drawn, enough is enough. If the West is reluctant to join the fight, Russia will do without it, but together with Iran and Iraq. The victory against terrorism will be utter and complete, but it will be a Russian victory. Although the door has not been completely shut, apparently in hopes that some people in the West will get a little wiser. All the same, at a certain point in time one will have to initiate a political dialogue in Syria. For the time being there’s no place for the US, EU, Saudi Arabia or Turkey to be found in it. But maybe it’s all for the better? Viktor Titov, Ph.D, is a political commentator on the Middle East, exclusively for the online journal “New Eastern Outlook”.